CLIP is a cost-share program designed to help landowners fix natural resource issues on private properties, including private residences, businesses and properties owned or managed by non-profits. Rural CLIP addresses working lands issues such as erosion, invasive species, water conservation and mud management. Urban CLIP works with non-agricultural landowners inside the Urban Growth Boundary to fix erosion issues, remove invasive species and manage stormwater with rain gardens. Properties must be located inside EMSWCD’s service area, which is all Multnomah County east of the Willamette River. 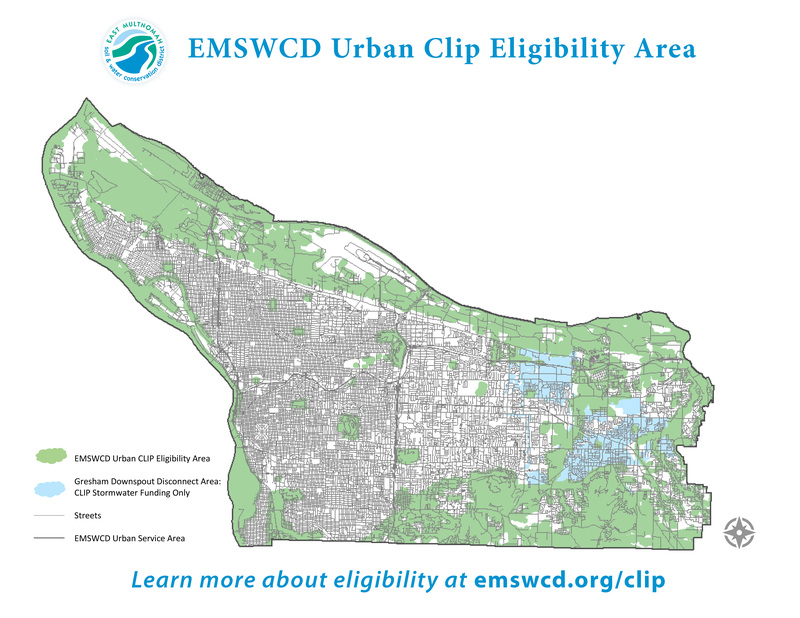 View a map of areas that are eligible for urban CLIP assistance in the EMSWCD Service Area. 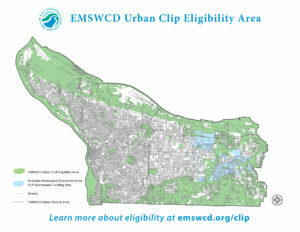 You can also download a map of areas that are eligible for Urban CLIP here, or click/tap on the thumbnail image to view. *Private single-family properties within Gresham’s Downspout Disconnection zone but not within 300 feet of a waterway or natural area are eligible for stormwater assistance only. Contact one of our staff (see below) and describe the issue. 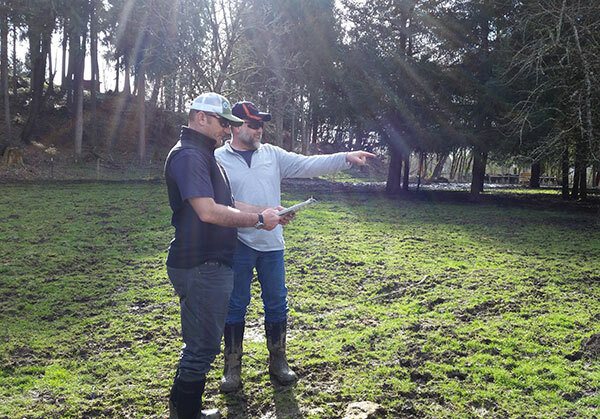 We will visit your property and help you develop ideas about possible solutions. Staff will explain what practices are eligible for CLIP funding and which are not. If the solution you choose is covered by the program, staff will develop a CLIP funding proposal for internal review. Sometimes this will involve additional conversations to improve and refine the project before it is finalized. Once the proposal is finalized, it will be presented to the EMSWCD Board for approval. Proposals are reviewed once a month on an on-going basis. Once the proposal is approved and signed, work can begin. Reimbursements for approved expenses will be distributed as receipts are received. Please note: Funding is contingent on approval by the Board of Directors. Ready to get started? Contact our technical staff!